Owning a house is a wonderful opportunity to build wealth and put down roots. But as any seasoned homeowner knows, houses come along with a seemingly endless to-do list of projects of varying levels of urgency. While essentials must be tended to, it is important as well to set aside time for lower priority tasks -– such as the five budget-friendly home-improvement areas with projects listed below. Targeting some of these areas of improvement can not only save you money in the near term but can boost the value of your home significantly. The single most cost-effective and practical way to boost your home’s value is to see to it that your home’s exterior looks good in all seasons. Real estate agents commonly talk up the benefits of ensuring good curb appeal when it is important to instantly impress potential buyers. The following two projects –- moderate landscaping in tune with the neighborhood and fixing up your entryway –- are two relatively simple projects that are very budget-friendly and carry with them a high ROI. Along with general upkeep such as trimming, mowing and weeding, consider planting some tasteful perennials or annuals that produce flowers with colors that complement your home’s exterior — flowering bulbs and rhizomes are great choices as they can be fairly easily propagated after each growing season and they don’t lack for color either. Annuals are more labor-intensive but can offer a wider range of colors, textures and shapes. Geraniums, marigolds, petunias and pansies are always good standby choices that will keep your flower beds in a mass of color all growing season. For a professional look, consider laying down a layer of mulch to give your beds an even tone, to cut down on weeds and help make those colors pop. Another cost-effective way to enhance your home’s curb appeal is to make your front door and entryway as attractive as possible. This need not break the bank, either. Some low-cost supplies can allow you to refurbish a weather-beaten wood door that could be brought fully back to life with a little effort. Consider painting your front door in a bold color that stands out yet also complements your home’s exterior. For example, if you have a white house with black shutters, consider red or burnt orange. In addition, low-cost fixes such as new lighting fixtures or a new doorbell will add instant charm to your entryway. Some low-cost finishing touches include a new doormat and a pot or hanging basket of flowers. 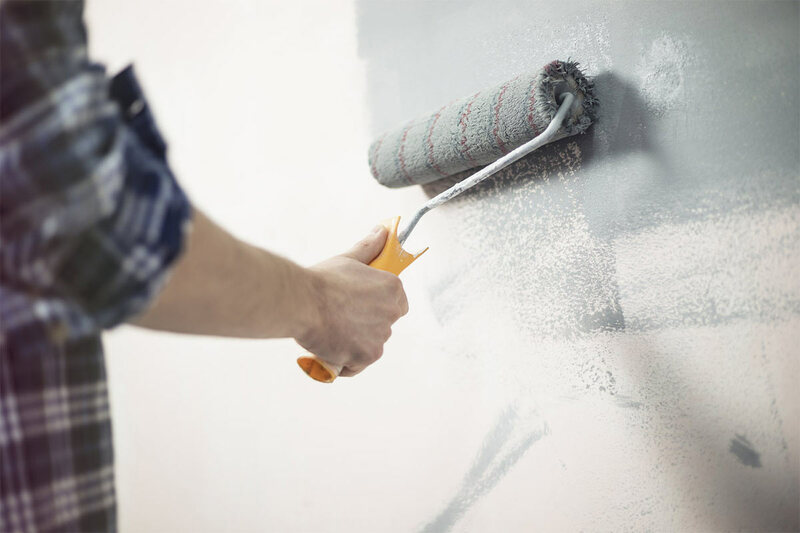 One of the most popular DIY projects, repainting your interior spaces is far and away the most cost-effective and productive ways to dramatically upgrade your indoor spaces. After a weekend of labor and some inexpensive supplies, it is almost magical how much a new interior paint job can liven up washed-out or otherwise dull rooms. If your home’s interior walls are average height, all you need is some painter’s tape, rollers, brushes and high-quality paint and a free weekend to create rooms imbued with a clean, fresh feeling. Do you wish you could refinish some drab or ugly floors but don’t have the time or money for a full refinishing? A simple, effective and low-cost alternative is to buy some durable floor paint, do some measuring, and put down a nice new pattern and color on those old wood floors. Geometric patterns are not only trendy nowadays but allow many possibilities for designs and colors that speak to your personality. The magic of a thoughtfully applied new coat of paint doesn’t stop there. The kitchen, sometimes called the heart of one’s home, is another interior space that can benefit from a well-planned, budget-minded approach. As long as your current cabinets are structurally sound, to turn those dreary-looking, dark cabinets into bright and cheerful ones, all that is needed is strong cleanser, a sander, a paintbrush and a weekend to affect a wholesale transformation of the feel and look of your kitchen –- all at a small fraction of the price of purchasing even budget cabinets. Conservation of energy and water is very popular all across the country, especially in certain regions where energy is expensive or water is scarce. These two factors alone can combine to save you money now and to boost the value of your home permanently. There are a great many ways to conserve these two resources, including by installing water and energy efficient appliances, double-paned windows, better attic insulation and by using LED light fixtures. In fact, many people unknowingly throw hundreds of dollars away each year through inefficient appliances and fixtures such as toilets, showerheads and dishwashers. To be certain, it might be a wise decision to have a full assessment done by a certified energy auditor or your local utility to identify areas where targeted improvements to your home could spell dramatic savings. For example, just swapping your old dishwasher –- or upgrading if you don’t have one — to a new Energy Star-qualified one could save upwards of $30 a year and over 500 gallons of water. If you’re replacing an old dishwasher, the good news is that no electrician or plumber is needed to install it -– just an open afternoon and some sturdy arms and legs. Decks everywhere undergo serious weathering that can transform once bright, cheerful planks into worn, gray and stained wood –- especially when considerable time has passed without much upkeep to speak of. Happily, even after one or even two decades of neglect, a successful deck renewal is indeed possible –- though it is the most time-consuming of these projects. One person would need up to a week to hand-scrub and power-wash the surfaces back to an approximation of newness. The last step is to brush the deck with a semi-transparent stain and bask in your handiwork as it dries.